Before tackling the subject of black holes, let's consider the concept of "escape velocity". This term is quite well known and thought by many to be the speed something must be travelling upwards to break it out of Earth's gravitational attraction. Naturally, it's not quite as simple as that (as it involves the science of ballistics), but it will suffice for this example. Logically, the stronger the gravitational pull, the higher the escape velocity needs to be. On Earth, for example, escape velocity is almost seven miles a second. The Sun, on the other hand, requires an escape velocity of nearly 384 miles a second. You may think, from these examples, that escape velocity is governed by the size of an object, but it isn't. It's all to do with its mass. As my school physics teacher used to say - "Mass is the amount of stuff in an object". Not the most technical way to put it, but, hopefully, you'll know what he meant. The Sun is more massive than the Earth. Now, suppose you had an object with a really high density - one that is quite small yet contains loads of "stuff", all packed in really tightly. That would make its mass really high, even with a small size. Then, imagine that it was so massive, its escape velocity was greater than 186,000 miles per second. Does that value ring a bell? Yes, it's the speed of light. In effect, with such an object, light itself wouldn't have enough speed to escape the gravitational pull of this object and would remain trapped there. The object would be, to all intents, invisible. And such an object is a black hole. It was a geologist, not an astronomer, called John Michell, who, way back in 1783, proposed the idea that an object could theoretically be so dense that light itself would be captured by its gravitational field. Such an object he termed a "dark star". Later, as Einstein's theory of relativity showed that light was indeed affected by gravity, it demonstrated how insightful Michell had been. As recently as the 1960s, it was still thought by many astrophysicists that a black hole could not form naturally. Einstein certainly was of this opinion, as he considered that an object would stabilise before it became suffiently dense for black hole formation. However, today we know better. There are three different ways that a black hole can be created. This is, by far, the most common cause for the creation of a black hole. In a celestial body, such as a star, there are two opposing forces at work - gravity, which is trying to draw the mass of it inwards, and internal pressure, which resists this inward attraction. Usually, these two forces stabilise, the star twinkles in space and everything is fine. Eventually, though, when the star's energy source is used up, this internal pressure is compromised and gravity then has the advantage. The star begins to collapse in on itself. In many cases, equilibrium is eventually reached once again, the result being a dwarf star, or even a neutron star. Sometimes, however, the original star was so huge and massive that the gravity is sufficient to overcome completely the internal pressure and the star continues to collapse to what is considered an infinitely dense point. It is then that it becomes a black hole. As I hope you've gathered, so far, formation of a black hole requires very high densities and one time where general densities were very high indeed was immediately after the Big Bang. Slight variations in the overall density of the Universe at this time allowed for the creation of black holes of all sizes - ranging from microscopic to ones containing hundreds of thousands of times more mass than the Sun. It's postulated that a micro black hole can be created in high energy collisions of subatomic particles. The laws of quantum gravity suggest this. Any such holes may occur when cosmic rays strike the Earth's atmosphere, but they evaporate within a nanosecond (that's very quickly). Okay, if black holes don't give off light, how can we see them, so we know they exist? Well, the answer's quite simple - they distort the spacetime around them and this is observable. In this image, the background stars around the black hole are distorted. Quite often, light is bent to such a ridiculous extent that a star's image will appear at either side of the black hole at the same time. This phenomenon is known as "gravitational lensing". There are several features of a black hole, some of which may sound familiar. If you're studying a black hole in a spacecraft (parked at a safe distance) and you're watching another spacecraft approaching it, there'll come a point where this other craft appears to stop dead, frozen in place. This is the place where light can no longer escape the hole's gravitational pull and is called the event horizon. The spaceship, of course, has carried on towards the black hole's centre, but that is something you'll never see. On board the doomed spacecraft, its crew will experience no change (apart from the fact that the unbelievably strong gravity is tearing them apart). This is defined at the radius of a hypothetical sphere that, if an object's mass was all contained within it, the escape velocity of this object would equal the speed of light. It was first calculated by German astronomer Karl Schwarzschild in 1915. Not many objects fulfill this criterion. Most celestial bodies have actual radii a lot greater than their Schwarzschild radii. The Earth's, for example, is just less than one centimetre. This means that, for the Earth to become a black hole, all of the planet would have to be compressed into a sphere with a diameter less than two centimetres. So, the conditions for a Schwarzschild radius being greater than the actual radius boils down again to good old density. In effect, the Schwarzschild radius is where the event horizon of a black hole occurs. Formulated by Indian-American astrophysicist Subrahmanyan Chandrasekhar in 1930, this is the absolute limit of mass an white dwarf star may have to maintain it in a stable condition. Any increase in mass beyond this limit will result in further collapse into either a neutron star or black hole. It has been calculated as approximately 1.44 times the mass of the Sun. 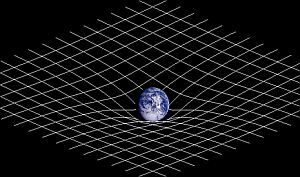 One of the conclusions from Einstein's theory of relativity was that the force of gravity was the result of spacetime being distorted. This graphic depicts the spacetime curvature created by planet Earth. As you can see, it's a sort of lattice depicting a two dimensional representation of spacetime coordinates. Earth, it appears, doesn't distort spacetime too much. On the other hand, this diagram shows how much spacetime is distorted by a black hole. 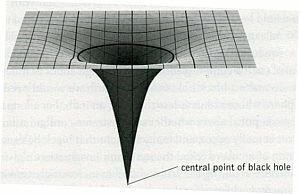 The "central point", referred to in the graphic, is the point where both gravity and density have become infinite. This is the black hole's "singularity". Supermassive ones have the mass equivalent of up to one billion Suns and quite often are found at the centre of galaxies - our Milky Way has one. 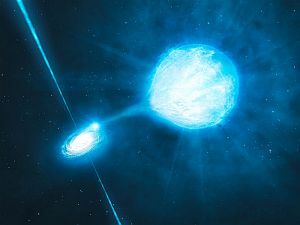 Stellar ones are more normal sized (if anything can be considered "normal" regarding these phenomena) and are formed from the collapse of one star. Will Black Holes Eat Up The Universe? This is an artist's depiction of an actual event. This black hole-star binary system has been discovered in the spiral galaxy NGC 300 (also known as Caldwell 70), in the constellation Sculptor, about 5.41 million light years away. Matter from the star is being gradually pulled over to the black hole by its intense gravity. Either the star will eventually be completely swallowed up, or it will become a black hole itself, subsequently merging with the other one. You may think, from this, that the supermassive black hole at the centre of the Milky Way, for example, will eventually swallow up the whole galaxy. In actual fact, this it true! The comforting thing is, it will take an unbelievably long time for this to happen. 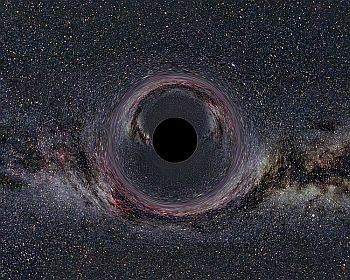 The stars at the galactic centre will gradually disappear into the black hole, so that, by the time the Sun is in danger, the black hole will have increased to 100 billion solar masses. This won't be for another million million million million million million million million million million years. It is thought that the black holes will eventually take over the Universe. Whether they manage that before the Universe experiences heat death or the "big rip" is something we'll never know. Does a black hole last forever? In theory, yes. It will continue to swallow up any nearby objects, becoming more and more massive. It has been predicted by some that the entire Universe could, one day, end up as a gigantic black hole. Even though the black hole's unique selling point is the fact that nothing can escape from it, that's not strictly true. In 1974, the formidable astrophysicist Stephen Hawking predicted that rotating black holes could actually give off radiation, due to quantum effects near the event horizon. This was subsequently shown to be the case and this emission was therefore termed "Hawking radiation". Such a black hole could, in effect, be emitting more material than it is absorbing. As a result, the hole would gradually become smaller, eventually evaporating. I bet you've not heard of these, have you? Before we go any further, I'm going to throw a mathematical concept your way. You know how Einstein's famous equation goes E=mc²? Well, it can also be written as c=the square root of E/m (trust me). Now, a square root can be both positive and negative (as in the square root of, say, 9 being both 3 and -3). In this mathematical context, the black hole is the positive version and the white hole is the negative. In the real world, however, white holes are very much hypothetical. They are considered to display exactly the opposite properties than black holes, if they could exist. Thus nothing could pass the event horizon, approaching the white hole, but matter would be escaping the hole, freely, in the other direction. As they are the opposites of each other, they could very well be linked, so that the matter falling into a black hole is then ejected by the white hole. 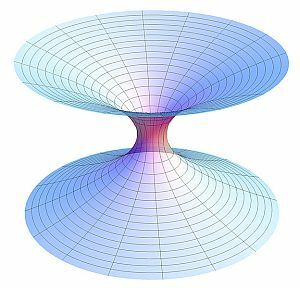 Thus, it is thought that the two holes' singularities are connected by an Einstein-Rosen bridge - or, more familiarly to you and me, a wormhole! Because wormholes bend spacetime, anyone passing through one would effectively become a time traveller. These wormholes are very unstable, however, so until technology becomes available to stabilise them, such possibilities lie far, far in the future. A pretty mindblowing concept, nonetheless.